The design is simple and ingenious (as all the best solutions are). 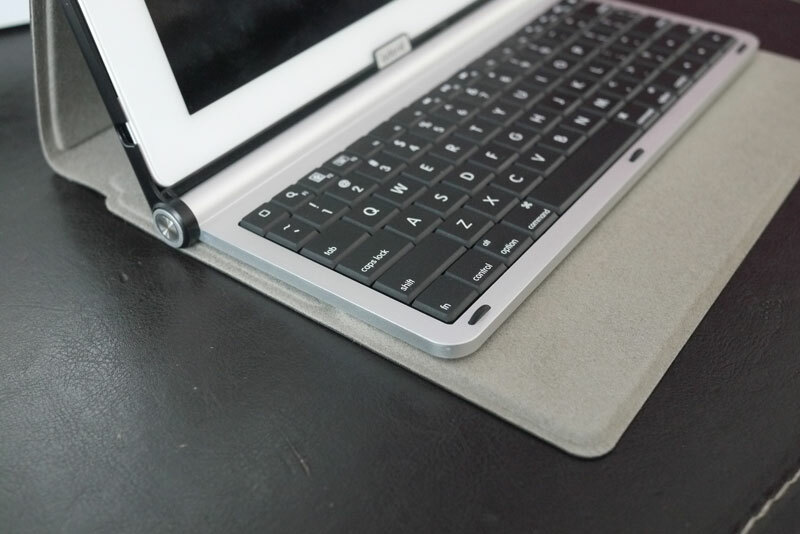 Consisiting of an outer soft case with a soft suede lining, a flexible plastic frame for the iPad, and the BlueTooth Keyboard, connected to the frame by a folding hinge. 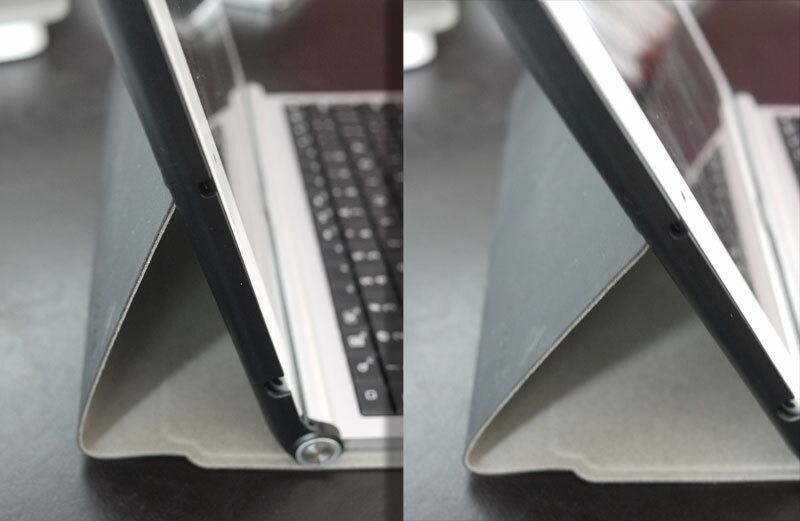 The outer case has magnets which secure the base of the keyboard at any position you desire. 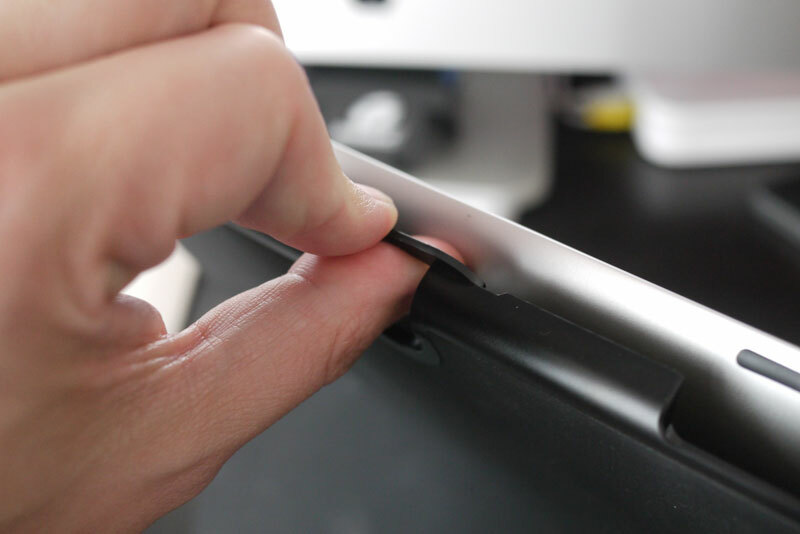 By sliding the keyboard forwards and backwards you can control the angle of the screen. 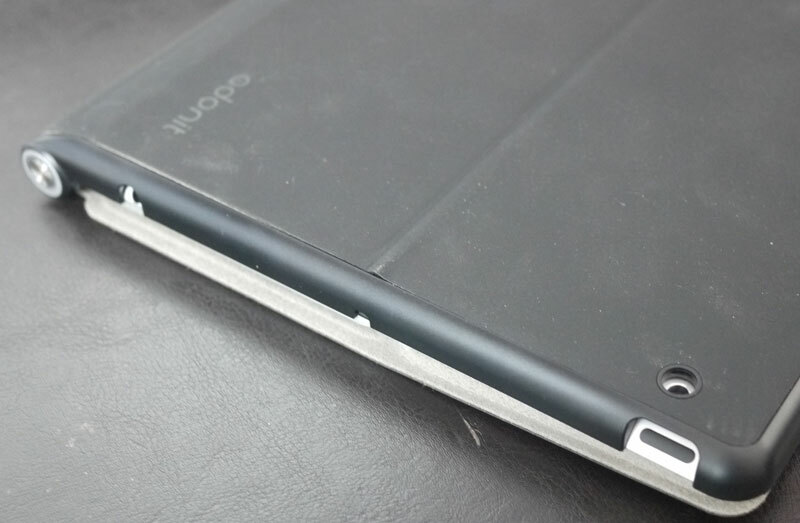 The iPad pops in and out of the frame very easily and all the ports are accessible whilst it is fitted. All good so far. 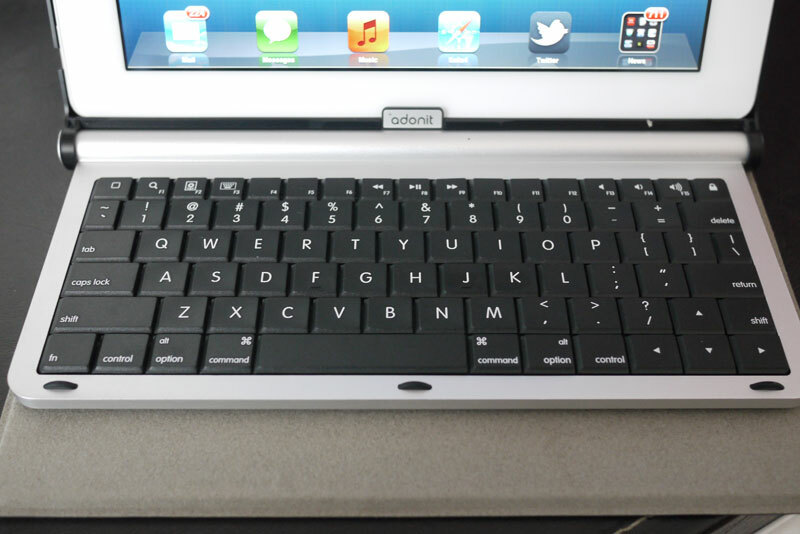 Adonit have also taken full advantage of the iPad2 features and so the iPad and keyboard will power off when the Writer is closed, a feature that was not available on the original iPad version and proof that Adonit haven’t just rushed out the same design for iPad2- nice one. Set-up is simple and straightforward. Anyone who has used an Apple Wireless keyboard will be familiar with how the batteries are fitted. Pop off the end cap of the ‘barrel’ between screen and keyboard and you find the space where the 3 x AAA’s (not supplied) live. The Writer can use rechargeable AAA’s but has no facility to charge them in-situ. Press the power button located at the other end until it flashes to initiate BT Pairing mode and pair as you would any other BT device. Adonit claim that 5hrs of typing per day should yield a month of use from a set of alkaline batteries with that time being extended if your usage of the keyboard is less. The keyboard is, by necessity, small but not overly so. Most of the keys are well placed and there are dedicated buttons for Home, Screen On/Off, Show/Hide on-screen keyboard and volume controls. The keys are a little spongy but I’m still able to type at a reasonable speed. They’re certainly better than the keys fitted to a Netbook that I own. My only very minor gripes are the right-hand shift key is very small and the Screen On/Off button is located directly above the Delete key where it gets pressed rather too often whilst I get to grips with the writer! Another plus of Adonit’s design is it will sit on your knee and balance perfectly, something ZAGGMates’s keyboard could not do being very top heavy. For those of you who are asking why I would want to go to all the trouble and expense of buying a keyboard for an iPad, rather than using a laptop, my reasoning is this. I frequently travel to trade shows for which I need to be able to blog and report on the go. Previously I have had to cart a MacBook around and, as the days are long, I also need to carry the power supply. That’s quite a heavy package to have to lug around the show floors. It means I need to carry a laptop bag and have to find power at least once during the day and wait whilst it re-charges. Earlier this year I experimented with the lightest possible solution when I travelled to MWC in Barcelona. Armed only with my iPad and ZAGGmate keyboard, not only was I able to perform all the functions that I needed but the battery lasted a full day of work without need of a re-charge, it was considerably lighter and far more convenient. I didn’t need a bag of any sort, carrying the iPad in my hand. The difference was notable, the reduction in weight reduced my fatigue and gave my shoulder a rest and not having to keep one eye on the battery level gauge was liberating. So the Adonit Writer is, for me, perfect. Currently on sale at $99.99, it is always going to be aimed at a niche set of users for whom a keyboard will be useful, but it’s superbly designed, works perfectly and makes me a very happy chap. It would be equally useful to journalists, bloggers writers, anyone who has a need to write more than the odd email or Tweet but does not want to have to lug a laptop around.